In my last post I gave a quick introduction to Lucene's facets; this time I'll drill down into some working code, by writing a very simple faceted search program which demonstrates the basic principles of Lucene Facets. The program indexes the two (fantastic !) Lucene books: Lucene in Action and Lucene in Action, Second Edition. For each book it adds an Author and Pub Date facets. Since I would like to focus on the aspects of indexing and searching with facets, and in order to keep the examples simple, I index only facets for each book. Lucene Facets are packaged with example code that you can use to start building your faceted search application. Examples are provided for simple as well as advanced scenarios (e.g. using sampling and complements). Note how each category is initialized as a CategoryPath, which holds the category hierarchy. It can be initialized with the category path components passed separately to the constructor (as in the example above), or by passing the full hierarchy string with a delimiter, e.g. new CategoryPath("Author/Erik Hatcher", '/'). Note that the taxonomy and search index use their own Directory instances. This is currently mandatory and cannot be avoided. FacetFields is the helper class which takes care of adding the categories to the taxonomy (via DirectoryTaxonomyWriter), as well as adding the needed fields to the search index. It is usually used either before or after you add the normal search fields to the Document. // needs to index / store, e.g. title, content, price etc. DirectoryReader and IndexSearcher are needed for executing queries on the search index. DirectoryTaxonomyReader is used to fetch data from the taxonomy. We open the readers on their respective writers in order to get NRT behavior, which allows the readers to view the changes made by the writers, without those changes committed first (notice that the code doesn't call commit()). Faceted search aggregates requested facets on all documents that match a query via FacetsCollector. You first define a FacetRequest per root node for which you are interested to aggregate top categories. The root node can be any node in the taxonomy tree, e.g. Pub Date/2004. You can also specify the lowest level in the taxonomy tree for which you would like to receive the aggregations. I.e., level=1 (default) means that you are interested in aggregating the immediate children of the root node, while level=2 means that you are interested to get the top categories of the immediate children of root, as well as each of their top categories. This is a powerful capability of Lucene Facets, which allows you to do recursive top categories aggregations. NOTE: in a normal search you will usually execute a different Query, e.g. one that was parsed from the user's request, and wrap FacetsCollector and e.g. TopDocsCollector with MultiCollector, to retrieve both the top ranking documents to the query, as well as the top categories for the entire result set. Let's take a moment to review the code. FacetsCollector returns a list of FacetResult, and there is one item in the list per requested facet. FacetResult exposes a tree-like API and the root node corresponds to the one that was specified in the request. The root will have as many children as were requested in the request (or less, as in this case). The traversal starts by getting the root and then its children (which denote the top categories for this request). NOTE: the label of each child node is actually the full path from the root, e.g. Author/Erik Hatcher. For brevity, I excluded the level of the root from the print (see the call to .getComponent(1)). This code returns all documents that matched the original query and are associated with the category Author/Michael McCandless. If we execute that query by calling searcher.search(q, 10) (i.e., return the top 10 documents), we'll receive only the second book, since only it is associated with that category. That's it ! You now know the basics of indexing and searching with Lucene Facets. You can use these code examples (and the ones that are packaged with Lucene) to start building your faceted search application. Faceted search, also called Faceted Navigation, is a technique for accessing documents that were classified into a taxonomy of categories. An example of a taxonomy is the Open Directory Project (ODP), which is an open source project aimed at building a catalog for web pages. For example, Lucene is classified in the ODP under Computers/Software/Information Retrieval/Fulltext/Apache Lucene. Faceted search gives the user a quick overview of the break down of the search results (e.g., how many documents are in category Year/2012 vs. Year/2011). It can also be used to simplify the user's interaction with the search application. For example, the screenshot below was taken from a book search application, which uses faceted search to let the user narrow his search by clicking facets of interest. 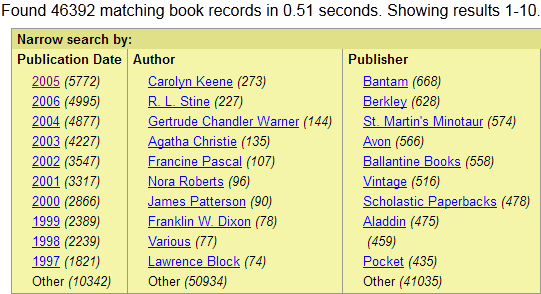 As you can see, the query returned 46,392 books, out of which 5,772 were published in 2005. To narrow the search to books that were published only in that year, the user only needs to click the "2005" link, and does not need to know how the books were indexed (i.e. the index field which contains the publication date information), nor the application's search syntax. In order to narrow the search to books that were published in May, 2005, the user needs to click the "2005" link, followed by the "May" link. The facets module manages a taxonomy. The taxonomy is discovered and built on-the-fly as categories are indexed for documents. It is used to write the needed data in the search index, in order to later execute faceted search efficiently. FacetFields can be used to easily index categories for documents. It receives a list of categories for a document and then adds them to the taxonomy as well as the needed fields to the document so that it can later support narrowing down a search by a facet value, as well as be used for facet aggregation. FacetsCollector can be used to easily execute faceted search and retrieve the top categories for a query. It receives a list of category roots to aggregate and returns the top categories for each requested root. The root can be any node in the taxonomy tree (e.g. "count all facets under /date/2011"), and top categories can be computed for the immediate children of root, or any in its sub-tree. Faceted search is executed by assigning weights to categories that are associated with matching documents. Traditionally, the weight of a category denotes its number of occurrences in the result set (hence 'counting'). Lucene facets, however, allow you to compute any weight for categories. 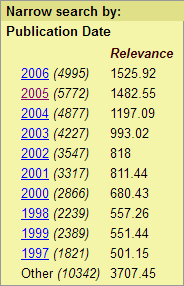 Notice how the facet Publication Date/2005, which exists in 5,772 result documents is now second in the list, with cumulative relevance weight of 1482.55 where the facet Publication Date/2006, which exists in 4,995 result documents (~15% less) is now first in the list, with cumulative relevance weight of 1525.92. An interesting side effect from weighting the facets like so, is that we can now observe that books that were written in 2006 are more relevant to this query (which we couldn't tell when we only counted facet occurrences). When the number of results is high (e.g. millions), aggregating the facets of every document may be expensive. Instead, you can aggregate the facets of a sample of these documents, and compute the top categories on that sample only. You can also request to get an exact aggregation of these top categories. When the number of search results is larger than 50% of the number of documents in the index, it may be cheaper to aggregate the facets of the complement results set (i.e. those that didn't match the query). To do that, we keep a TotalFacetCounts which maintains total counts for requested facets (i.e. their total count over all documents), and during search, we count the complement set of the matching documents. The complement counts are then subtracted from the total counts, to compute the top categories. NOTE that I use the term 'count' and not 'aggregation'. That is because not every aggregation function can support facet complements counting, e.g. sum(#relevance). Near-real-time (NRT) search was added to Lucene in version 2.9. It eliminated the need to perform the expensive commit operation in order for readers to pick up the index changes. With NRT, you can choose to commit only when you would like to ensure that the index data resides on stable storage, and use the NRT capabilities in order to expose index changes to the readers. Lucene NRT is discussed in many blogs and web pages; you can read about it here, here and here. Faceted search recently became NRT (to be released with Lucene 4.1). This means that you no longer need to commit changes to the search and taxonomy indexes, but rather reopen your TaxonomyReader, just like you would reopen an IndexReader. If you are a Lucene facets user, you can give it a try by using a 4.1-SNAPSHOT version. Don't forget to report back any issues that you find! One of the requirements to being NRT is for the reopen task to do work that is proportional to the amount of new data that was indexed. I.e., if your index already has 100 million documents that are visible to an IndexReader, and in the latest session you indexed only 10,000 documents, then reopening that reader should only read data relevant to these new documents. Lucene facets support NRT in two ways: (1) when you reopen the taxonomy index, only new categories are read, and (2) faceted search does not use any global data structures in the search index, and therefore support NRT as well.